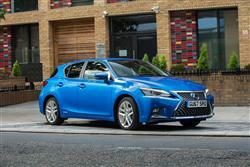 Find out everything you need to know on the new Lexus Ct from independent vehicle review website Car And Driving. You can watch the video review to the left to see more of the car or read their written review below to get a true insight from an expert in the automotive industry. If you're seeking a spaciously compact, prestigiously badged premium five-door hatchback, then you're probably thinking diesel power and German badgework. Here's a different way to go, Lexus' much improved first generation CT200h petrol/electric hybrid. The original version of this car needed a little perfecting but it's now a far more credible choice that's classy to own, efficient to run and kinder to the environment. Hybrid power may be a trendy thing to have in the compact executive segment right now but it certainly isn't a cheap option. You'll need a budget of around £35,000 to £40,000 for the BMW 3 Series or Mercedes C-Class options and even Lexus' own IS300h is a £30,000 car. Hence the appeal of the brand's entry-level CT200h model, which starts from well under £25,000, even if it's well specified. That's possible because this car runs on humbler non-Plug-in Toyota Prius underpinnings - mechanicals which are awarded more of a premium sheen with the adoption of the Lexus badge, especially in this much improved model. 'CT' stands for 'Compact Tourer', Lexus-speak for 'Premium Hatchback', the class of car that sits below the 3 Series and C-Class segment that Lexus attacks with its IS model. Think models like Audi's A3, BMW's 1 Series, Mercedes' A-Class - maybe even Alfa Romeo's Giulietta and you'll get the idea. Cars that are no bigger than something Focus or Astra-sized but sit a world apart when it comes to perceived driveway cred. None of them offer a hybrid option - which is where this Lexus ought to score. There are no mechanical changes to this revised CT200h, so the driving experience is much as before. Press the 'Start' button and the virtual silence is very, very different from the ugly, grumbly diesel note delivered by this car's competitors. That's because from start-up to speeds of up to 28mph or for distances of up to a mile and a half, the car (in theory anyway) is supposed to automatically operate in 'EV' mode under electric power alone. This brings me to the engine which, despite all this talk of electric power, will remain this car's primary source of propulsion in day-to-day use. It's exactly the same 1.8-litre VVTi petrol unit you'll find in Toyota's Prius and contributes a further 99bhp to the 82bhp already delivered by the electric motor, though never at the same time, which is why, slightly confusingly, the total power output of this car is quoted at 134bhp. Once you're up and running with battery and petrol power chipping in and out, there's a centre drive controller which you can set either to 'NORMAL', 'ECO' or 'SPORT', depending on how you want to drive. The 'SPORT' setting delivers an extra 150V of extra electric motor power to enable a rest to sixty sprint time of 10.3s as engine revs are held longer, throttle and steering response sharpened and the traction and stability control systems rendered less intrusive. On the move, the re-tuned suspension that Lexus introduced in 2014 has improved the original model's unforgiving ride. At that time, the brand also remapped the hybrid drive system's transmission control. This allows for a more linear build-up of engine revs, more closely matching the increase in vehicle speed. The result is a driving experience more akin to a conventional automatic transmission. Exterior changes to this revised model are relatively minor. The front gille has a smarter mesh pattern, the foglamps now have grey bezels and at the rear, there's a re-shaped bumper and the tail lamps now feature all-LED technlogy and have a wider, sportier look. Go for a top 'Premier' or 'F Sport' model and you get daytime running lights repositioned so as to sit above the single-projector bi-LED headlights. Inside, the cabin remains one of the classiest in the segment, with its high-quality materials and rich surface textures. The Lexus Premium Navigation System fitted to top variants benefits from a larger 10.3-inch screen and there's a wider range of upholstery choices. Otherwise, things are much as before. We love the cockpit-like feel of the low-set, perfectly-sited driving position and the way all the controls fall neatly to hand and operate with a quality click .The Optitron instrument binnacle is available with an integral 4.2-inch TFT screen, which can be linked to the car's multimedia system and controlled using switches on the steering wheel. And practicality? Well you might expect this to be compromised by the need to find somewhere to stow the hybrid system's nickel-metal-hydride battery pack. As it turns out, clever packaging of this unit between the rear wheels means that it takes up very little bootspace, the 375-litre luggage bay actually being larger than that offered in a BMW 1 Series. Push forward to 60:40 split-folding rear seats and up to 985-litres of space is freed up. As for rear seat room, well if you're tempted to complain, then you clearly haven't sat in the back of a rival BMW 1 Series or Audi A3 very recently. Prices sit in the £23,500 to £31,500 bracket and there's a choice of 'SE', 'SE Plus Pack', 'Luxury', 'F Sport', 'F Sport Premier Pack' and 'Premier' trim levels. The 'F-Sport' version doesn't get any mechanical changes but has been upgraded with performance dampers, an auto-dimming rear-view mirror and Lexus Navigation. Even the base 'SE' model features dual-zone air conditioning, 16-inch alloy wheels, rain-sensing wipers, a Drive Mode Select system, a reversing camera, a six speaker audio system and a seven-inch Lexus Media Display infotainment set-up with rotary controller. Safety-wise, the CT adopts the Lexus Safety System+ package on all versions above 'SE' grade, a set of active safety features that can help prevent or mitigate collisions in a wide range of traffic situations. Its advanced technology features include a Pre-Collision System, Adaptive Cruise Control, Lane Departure Alert with Lane Keep Assist, Automatic High Beam and Road Sign Assist. Otherwise, a 5 star Euro NCAP showing is justified by the inclusion of no fewer than eight airbags, including knee protection for driver and passengers. Plus of course, it goes without saying that the CT has the full complement of electronic braking, stability and traction controls. Cost of ownership is where the CT200h can really hurt its conventionally-powered rivals. True, you'll need to take the official combined consumption figure of 74.3mpg with a pinch of salt - achievable but not in the real world - but even given that, you shouldn't be disappointed with returns at least the equal of the best diesel competition. Throw in the fact that this is the only premium executive car with automatic transmission to be exempt from the London congestion charge, plus what's almost certain to be a snail-like rate of depreciation and the running cost package looks even more compelling. The parallel hybrid technology employed here might be fairly conventional - we're on the cusp of a transition to plug-in lithium ion batteries - but that's probably a good thing as it's fully proven and, in any case, protected by a 5 year/60,000 mile warranty. It's certainly good enough to deliver a CO2 emissions figure that, with 16-inch wheels, is rated at 88g/km. That's 20-30g/km better than a comparable Audi A3 2.0 TDI or BMW 118d in manual form and 40-50g/km better if you're looking at those cars as automatics. Plus this Lexus will incur zero road fund licence charges but what's really important is the way it can deliver rock bottom company car tax, with ratings starting from just 17 per cent. Before this car first arrived, the UK market's provision of hybrid power was limited to compact cars and rather large ones. With this improved sleeker, safer CT200h, Lexus continues to neatly plug the gap in between and on paper, its promised combination of driving fun and eco sensibility is certainly a very tempting one. In practice, this car is somewhat restricted by the limits of its Prius mechanicals but that doesn't stop it delivering a package that will still be compelling to many target buyers. True, a rival diesel BMW 1 Series or an Audi A3 will be better to drive. But, spec-adjusted, both will cost you more to buy, be noisier to live with, confine you to nastier cabins and cost a whole lot more to run on pricier fuel. To us, the limits of this Lexus seem a fair trade in exchange for all these benefits. This car adds up. On the balance sheet. And in your driveway.